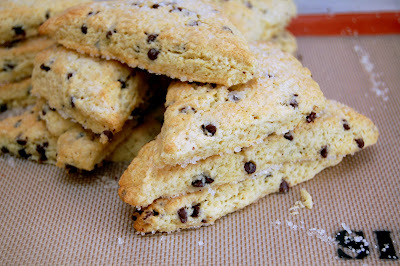 In writing this post I headed over to Allrecipes.com to grab the recipe for these scones. I was excited to find that these are actually the "Recipe of the Day" today, and that my photo is the one to accompany it! Fun! I love these scones and have made them on several occasions. Any time I can get away with eating chocolate for breakfast, I do. And these are quick to disappear from any brunch table. Good ol' Grandma Johnson never lets me down. Preheat oven to 350 degrees F (175 degrees C). Lightly grease a large baking sheet. In a large bowl, mix the flour, sugar, baking powder, cream of tartar, and salt. Cut in the butter. Stir the sour cream mixture and egg into the flour mixture until just moistened. Mix in the chocolate chips. Turn dough out onto a lightly floured surface, and knead briefly. Roll or pat dough into a 3/4 inch thick round. Cut into 12 wedges (or 24 for mini scones), and place them 2 inches apart on the prepared baking sheet. 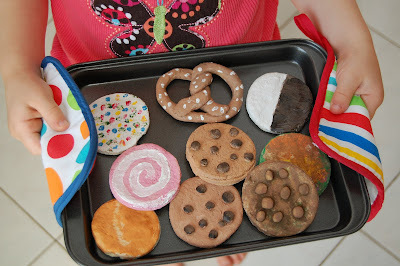 Bake 12 to 15 minutes in the preheated oven (10-13 for minis), until golden brown on the bottom. Substitute 1 cup raisins for the chocolate chips and add a teaspoon of cinnamon to the dough for a yummy variation. Thanks, Sara! These look wonderful! I've seen this recipe and how highly rated it was. Glad to know that it really is a winner. Thanks for linking this up to Sweets for a Saturday.